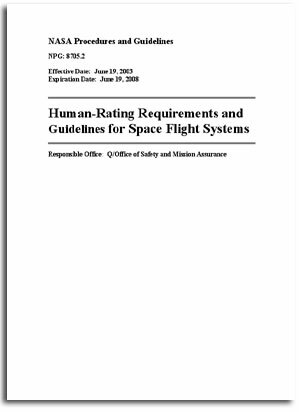 NASA has posted the "Human Rating Requirement and Guidelines for Space Flight Systems," on the agency's Web site. The document contains requirements and guidelines for certifying the design of future agency space vehicles carrying humans. An interdisciplinary team of agency experts and engineers produced this NASA Procedures and Guidelines document. It will serve as a 'blueprint' for providing the maximum reasonable assurance the design and operations of future human space flight systems present minimum risk to the flight crew and occupants, as well as those involved in and exposed to space flight activities.